A particularly dramatic view of comet 67P/C-G due to the angle of solar illumination, this is a mosaic made from four images acquired by Rosetta’s NavCam on January 16, 2015, from a distance of 28.4 km (17.6 miles). The assembled image shows the larger “bottom” lobe of 67P, with a flat region called Imhotep along the left side and, on the lower right, the transition area stretching up to the comet’s smaller “head” lobe. Outgassing jets can be seen as faint streaks at the upper right, and ejected dust grains show up as bright specks above its surface. Also in this view is one of 67P’s larger boulders, a somewhat pyramid-shaped rock dubbed “Cheops.” Can you spot it? One in a cluster of boulders on 67P’s “underside,” Cheops is about 45 meters wide and 25 meters high (148 x 82 feet). Scientists are still working to determine the nature of 67P’s boulders. It’s not yet known what they are made of or how they came to be where they are observed today. Did they fall into their current positions? Or were they exposed upwards from below as a result of the comet’s activity? And why do they have alternating rough and smooth areas on their surfaces? “It almost looks as if loose dust covering the surface of the comet has settled in the boulder’s cracks. But, of course, it is much too early to be sure,” said OSIRIS Principal Investigator Holger Sierks from the Max Planck Institute for Solar System Research (MPS) in Germany. As comet 67P approaches perihelion over the course of the next six months we will get to see firsthand via Rosetta what sorts of changes occur to its surface features, including office-building-sized boulders like Cheops. A lunar boulder catches the last edge of the setting sunlight in this image from the Lunar Reconnaissance Orbiter Camera. The boulders litter the floor of an unnamed 3.5 km wide (2.17 mile wide) crater located within the much larger crater Lobachevskiy. The smaller crater’s rim casts its shadow along the left side of the image, and raises the question: why are shadows on the Moon so dark? On Earth, air scatters light and allows objects not in direct sunlight to be still well-lit. This is an effect called Rayleigh scattering, named for the British Nobel-winning physicist Lord Rayleigh (John William Strutt.) Rayleigh scattering is the reason why the sky is blue, and (for the most part) why you can still read a magazine perfectly well under an umbrella at the beach. On the Moon there is no air, no Rayleigh scattering. So shadows are very dark and, where sunlight hits, very bright. Shadowed areas are dramatically murky, like in the LROC image above, yet there’s still some light bouncing around in there — this is due to reflected light from the lunar surface itself. Lunar regolith is composed of fine, angular particles of very reflective dust. It tends to reflect light directly back at the source, and will illuminate objects within shadows as well — as seen in Apollo mission photographs. Astronauts within the shadow of the landing modules were still visible, and their suits were well illuminated by reflected light from the lunar surface. Some people have used this as “proof” that the landings were actually filmed on a sound stage under artificial lights, but in reality it’s all due to reflected light. Here’s a great run-though of the lunar landing photos and how lighting on the Moon works. So even though air isn’t scattering the sunlight on the Moon, there’s still enough reflection to sneak light into the shadows… but not much. It gets dark — and quickly cold — in there! Some interesting boulder trails in there! See this image on Arizona State University’s LROC news page here, and zoom into the full NAC scan here. 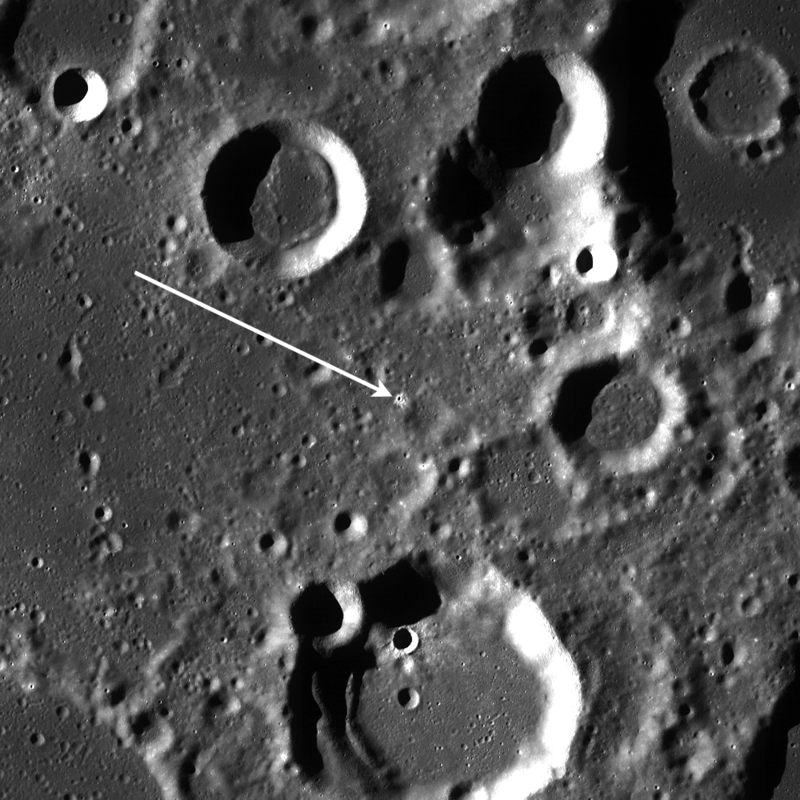 The crater shown above is located in the lunar highlands and is filled with and surrounded by boulders of all sizes and shapes. It is approximately 550 meters (1800 feet) wide yet is still considered a small crater, and could have been caused by either a direct impact by a meteorite or by an ejected bit of material from another impact. Scientists studying the Moon attempt to figure out how small craters like this were formed by their shapes and the material seen around them…although sometimes the same results can be achieved by different events. For example, when an object from space strikes the Moon, it is typically traveling around 20 km per second (12 miles/sec). If the impact site happens to have a very hard subsurface, it can make a crater with scattered bouldery chunks composed of the hard material around it. But, if a large piece of ejected material from another impact were to strike the lunar surface at a much slower speed, as ejecta typically do (since they travel slower than incoming space debris and the Moon’s escape velocity is fairly low, meaning any ejecta that does fall back to the surface must be traveling slower than 2.38 km/s,) then the ejected chunk could break apart on impact and scatter boulders of itself around the crater…regardless of subsurface composition. You can read more about this image on Arizona State University’s Lunar Reconnaissance Orbiter Camera site here. And as an added treat, take a look deep into the shadows of the crater’s interior below…I tweaked the image curves in Photoshop to wrestle some of the details out of there! Brightening the shadowed area reveals details of the crater floor...and even more boulders!